Rushing home Thursday evening I was filled with anticipation and a certain unknown dread. 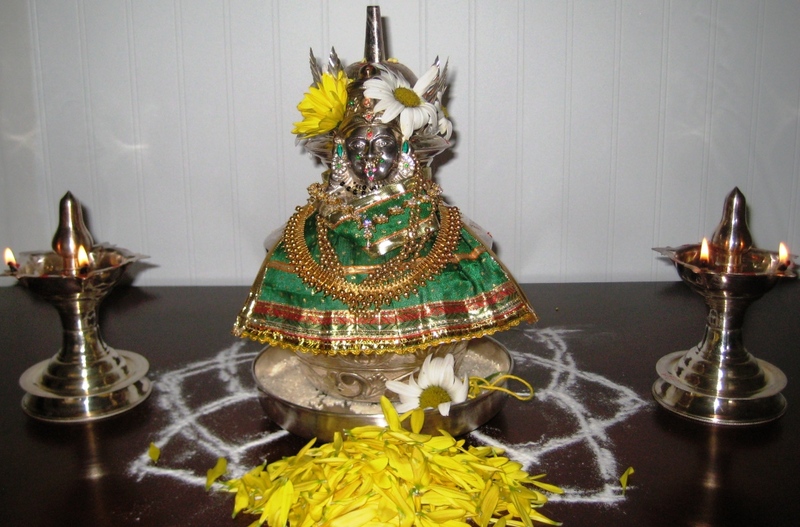 I had opted to do the Varalakshmi pujai a week later than it was normally done. I could have joined my SIL the week before. Life could have been easier. But something in me demurred. And am glad it did. The past few days have been very meaningful for me. It felt like a reawakening of faith. I have dabbled with the thoughts about faith and God for years now never really believing or not believing. Something the past three days made me realize what I had been searching for. Unrelated to this pujai, a few months ago, I was invited for lunch at our local grocery shop owners home. This was my first visit to her home and K and I had a good time. After lunch as a few of them played badminton, I sat on their rather spacious deck talking to the lady and another guest who was there. Only moments before our hostess shared her private brindavan with us. She was an ardent Krishna Bhakt. Inside her home was a replica of Mt Govardan, a mini brindavan and every little detail that I had read in mythology books painfully recreated to perfection. As we stood there admiring the beauty, there was a voice in me that seems like an aberration now. I could not relate to the level of faith and belief our hostess had. I enjoyed the aesthetics of it but did not grasp the beauty behind her love for the little baby sleeping in the cradle. The reason this came back to me this week is that as I opened the bag that housed my Ambal mugam I felt a new feeling wash over me. I unpacked the associated paraphernalia and carried the mugam lovingly over to the sink where I carefully turned the faucet to warm before I gave sponge bath of sorts for the deity. Over the next few hours, I amazed myself by how much I enjoyed the process of decorating and setting up the altar for the next day’s pujai. The pujai itself was fairly short but what was important to me was the process of discovering my faith. I have seen my amma and aunts refer to the ambal as a living breathing entity being careful to offer food at regular intervals and being cognizant of a divine presence in the house. I had never felt it in the many years I was part of this ritual. Something changed this year and for the first time I felt it in me. A very personal connection to the divine. A tradition that suddenly brimmed with promise. As I bowed deeply and felt touched by something intangible, it dawned on me why the person who recreated Brindavan in her home did it. A whole of things made sense actually. The feeling of peace Akay described about her visit to Varanasi. The need to visit ancient temples by another friend. The compulsive quest for the perfect almirah to house her Gods by my cousin. The list goes on but the one thing that ties it all together is that Faith is an intensely personal thing. Wow!! A profound and simply beautiful post Laksh! I love the way you write things like these with such elan. And loved the picture and Hrudaya kamalam kolam too. Lovely post. Your Ambal looks so beautiful Laksh. Faith – for those who believe no proof is necessary, but for those who do not believe no proof is possible, isn’t it..? glad you rediscovered yours. We all need something to hold on to and draw meaning out of life. I am very happy to see this post Laksh. I felt strong instinct to leave a note here whenever I see you dabbling about faith and God. But one should experience it by themselves and it should come from within . And the Time has come now. Knowing you came from a traditional family , you are already following many traditions which are very meaningful. This is a bliss on us. As GITA says ,once you are aware of the existence you should stick to it. All the very best. Ambal looks very pretty Laksh! Very interesting post. Doing Puja or going to church, to me is very similar to visiting your friend. Such visits and the rituals keep the spark in the relationship to God or to friend. Otherwise, eventually we loose it eventually eventually we don’t even care /know we lost it. may be I am not making it clear enough? love to have you back in action Laksh. heard of a trip next weekend to one of your regular visitor. have fun! Faith is something to be discovered and you are in the right track. For me personally, I have always been a Yo-Yo follower, I have been through the aethist phase and then started following different religions by either reading other scriptures or visiting their institution, final destination is back to where I belong and am very comfortable with it. I still have a long way to go to get that aha moment. I like the way you described yours, you sure have a way with words. I can understand every bit about your wavering faith. @gayathri: Thank you! Didn’t realize the kolam had a name. @Suman: Absolutely with you on your last line. @Hema: Definitely something each one should experience on their own. @M: Agree! I thought ambal was lively too. @sachita: am sure! by the way even though I do not comment, I read all of your posts and enjoy them. Thought of sharing wiht oyu laksh. Have a good week!